Entertaining For Both Your Dog And You! This is a food dispensing toy and feeder. It sits upright until pushed with a dog's paw or nose, then it wobbles, spins and rolls unpredictably, dispensing treats through a KONG-shaped hole near the top. Quite entertaining to watch. Made in the USA of durable, FDA food-approved, high-strength polymer. Unscrews for quick filling and easy clean-up, and is top-drawer dishwasher safe. Suitable for all dogs weighing 10 pounds or more. Measures 7 x 6 x 10.5 inches. "She has a lot of fun with it and it is very entertaining for us and our friends watching her playing." 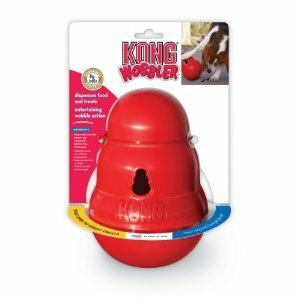 Thank you for stopping by our Dog KONG Toys: KONG Wobbler page!